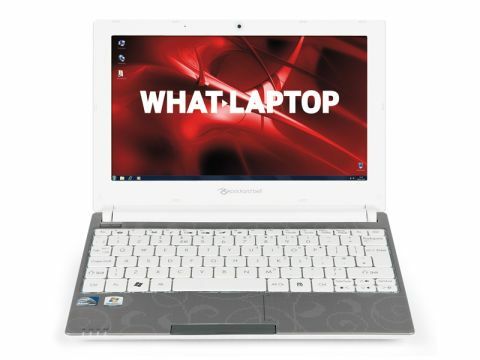 Since being bought by Acer in 2008, Packard Bell has gone from strength to strength, releasing a wide range of high-quality laptops and netbooks. The updated Dot S adds to this legacy, combining great usability and unique features at an equally pleasing price. Acer's involvement can be seen in the design of this device, as it is built around the same chassis as the Aspire One D260. Available in a choice of black or champagne colour schemes, you will either love or hate the patterned finish. Build quality is excellent and the resilient plastics will be more than tough enough to withstand daily family use. The slim chassis can easily be carried in a small bag, with the fantastic 502-minute battery life only beaten here by the Acer Aspire One D260. The spacious keyboard has all the strengths of the Acer. It is a pleasure to use, with a near flawless typing action. The white keys of the champagne model are easily tarnished, however, so you may prefer to opt for the black model. The spacious touchpad is great to use, with its wide design matching the screen of the Dot S perfectly. A slim scrollbar on the right-hand side of the touchpad makes it easy to scroll vertically through documents and web pages. The bright 10.1-inch screen shows photos and videos to great effect. The low resolution is common on netbooks and reduces sharpness somewhat, but not drastically so. The screen can also be folded back almost 180 degrees, making it easy to find a comfortable viewing angle. A unique feature of recent Packard Bell netbooks and laptops is a dedicated social networks key. When pressed, a proprietary software application opens and provides instant access to Facebook, YouTube and Flickr. This is sure to be a hit with younger users. Packard Bell also trumps the competition by including a full version of Adobe Photoshop Elements software as standard. This excellent entry-level photo editing package makes it easy for first time buyers to tweak their photos. The only real flaw of the Dot S is that it shares the same limited storage as the Acer. The 160GB hard drive will be capacious enough to store most collections of music, photos and videos, but is vastly bettered by the 250GB Asus Eee PC Seashell 1015PE and Dell Inspiron Mini 1018 drives.